Well, it’s a provocative title, and it’s a provocative book – though it would be unfair to suggest that Siya Khumalo’s sole aim is to provoke. Like many memoirs, this one is also a taking stock of The Life So Far, in this instance (mainly) the author’s struggle to reconcile his somewhat unconventional religious instincts with his unruly sexual instincts. 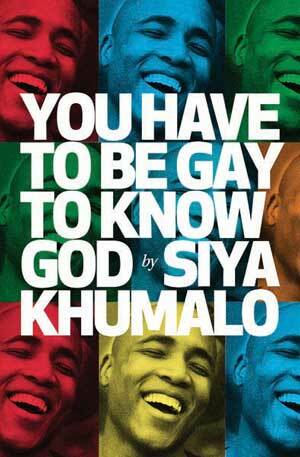 Like many young men uncertain of their sexual identity, the young Khumalo decides that God’s not on his side of the problem: “God and the homophobes had different ways of inflicting their violence, but they belonged to the same WhatsApp group and he was the administration.” In short, since he believes he loves God, how is he to reconcile this love with his love of men? God, in this form, is perhaps indeed knowable only if you are gay, and may not be everybody’s idea of a respectably deity. I must report that the sexual scenes, of which the above is a mild example, are probably the most graphic I’ve read anywhere, and I have read widely. They are, though, prevented from being merely prurient in that they form part of Khumalo’s stringent attempt to redefine God through a concept of love that embraces all aspects of being. But these over-the-top scenes are not Khumalo at his best, nor are the long and rather abstruse disquisitions on the nature of God: he is much more accessible in his more usual sardonic-humorous mode, as when he surveys South African society, from the townships to the seats of power, from impoverished streets through a spell in the army, to glitzy gay pageants. The young Khumalo’s progress was facilitated by an uncommonly accommodating mother, who supported him in every aspect of his growing up, including his sexuality: “But, a gay son! God must have really taken a shining to me. Why else would I be so blessed?” She also bequeathed him some uncommonly good genes, enabling him to become Mr Gay Durban 2014 and runner-up to Mr Gay South Africa. This section of the book reflects Khumalo’s more freewheeling, less introspective aspect, and, as such, makes for easier reading. Part Three, by contrast, is, by and large, densely argued, formidably documented, and not always easy to follow, probably because even here Khumalo is playing games with his reader. I found it difficult, for instance, to gauge his misgivings about the Constitution, which, he argues, “is not the one the majority thinks is worth fighting for. It’s never entitled them to full restitution or redress for loss suffered during apartheid.” Of course, it’s true that the Constitution has not delivered these things; what it entitles is a question for a constitutional scholar. But the real difficulty is deciding where Khumalo stands on this question; for the Constitution, as he well knows, guarantees his right not to be discriminated against as a gay man: a right, as he also knows, relatively rare in the populist regimes of Africa. Well, you’ve been warned. It can be a rough ride. But it can also be a bracing experience: read the book.